Part- I deals with General Instructions applicable to all Examinations. The Chief Superintendents and the Departmental Officers are informed that Bar Coding is continued to all subjects for SSC, OSSC and Vocational Public Examinations, March 2018. 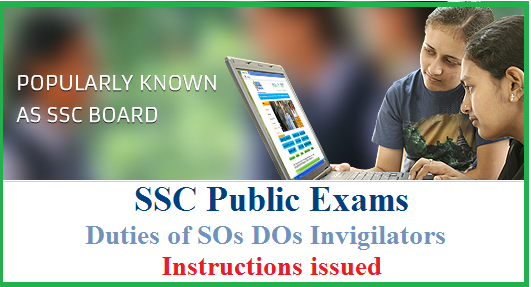 The method of conducting of First language paper- I to Social studies paper- II, OSSC and Vocational Papers, detailed instructions are given in the part- II of these instructions. Any deviation / mistake / lapse on the part of the Chief Superintendent, the Departmental Officer and Invigilators will lead to severe consequences such as withholding the results of the candidates in large numbers, non identification of the answer scripts of the candidate in marks wanting cases and Re- verification / Recounting cases besides initiating severe disciplinary action against the Chief Superintendents, the Departmental Officers and the invigilators concerned.